Something has been missing from the apartment. 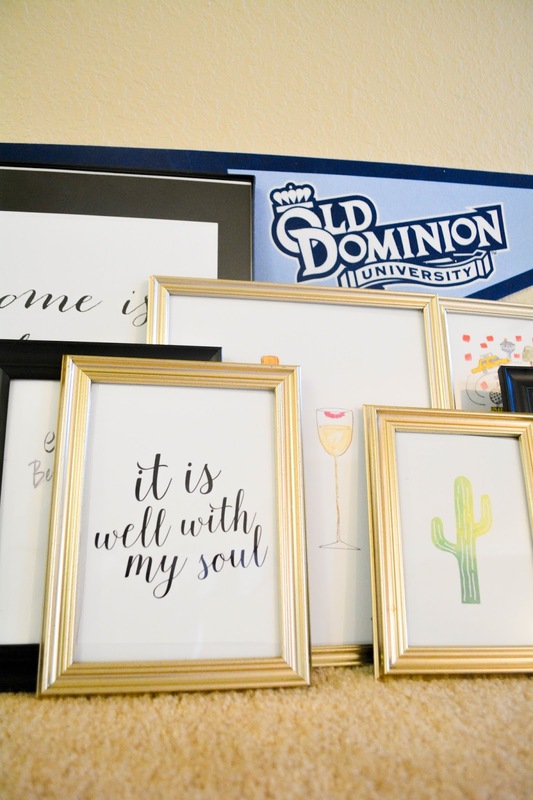 Something that makes this place officially feel like home. And that this was pictures! 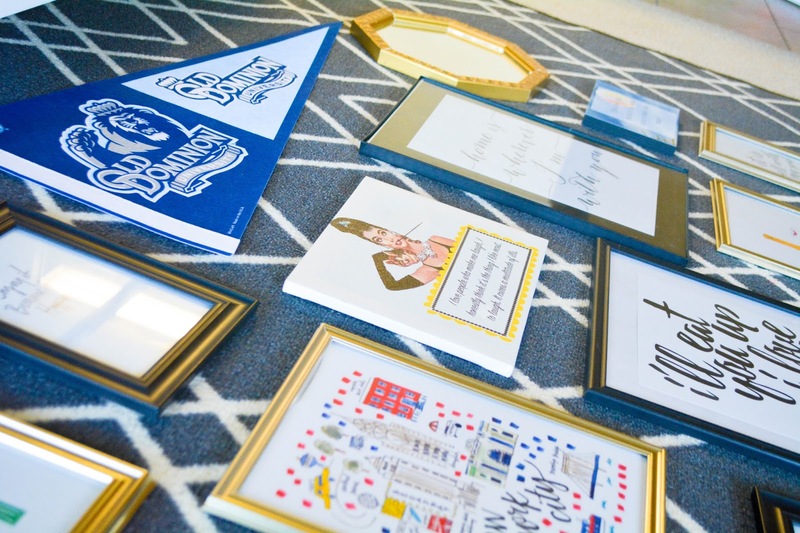 I have tons of picture frames but nothing in them. Also, I wasn't sure if I was allowed to hang stuff up in my apartment until I talked to the front desk people and got the thumbs up! So when Omar was in the field last week I put together some amazing prints to make a gallery wall! I also printed out a lot of personal pictures of family and friends but those are scattered around everywhere. The gallery wall is some of mine and Omar's favorite quotes and prints that we both enjoy. 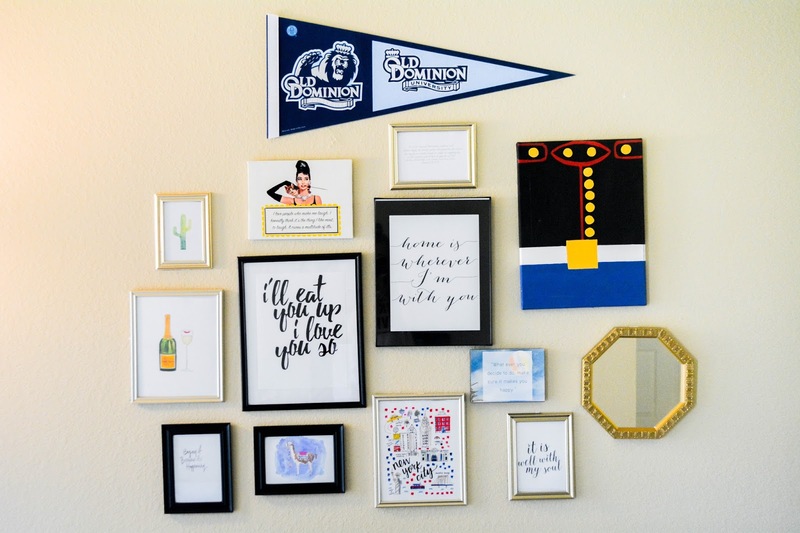 The key to making a gallery wall is to think outside the box. Not everything has to be the same size and shape and color. In fact, it looks a hundred times better if it's not. My grandma got me a ton of black & gold frames (from the dollar store, seriously you don't need to get all fancy with it) and all I had to do was print some pictures out. Now my collection of pictures are sort of from everywhere.. I listed below were everything is from. 'It Is Well' Quote - I made this myself on Photoshop. It wasn't hard at all. I just had a blank canvas, picked a font, and layered it how I wanted it. The frame is from the dollar store. Llama Print - This cutie pie is from Evelyn Henson. I follow her on Instagram and she is super creative. 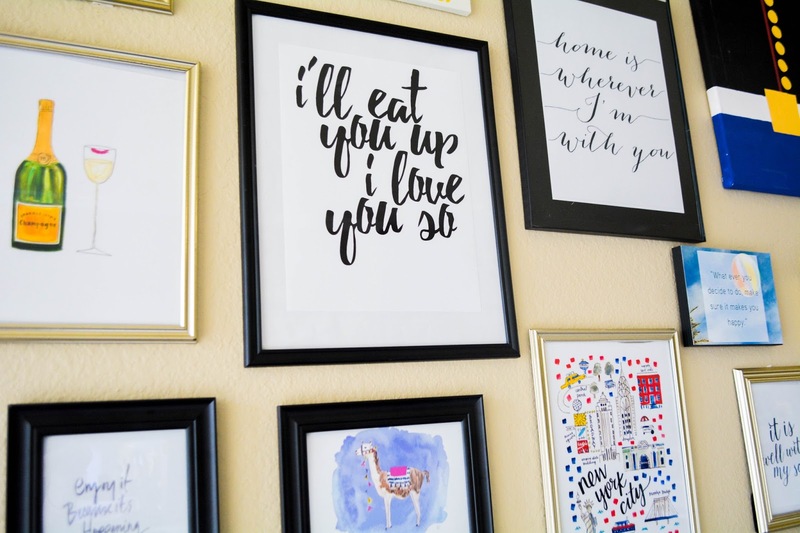 I love her prints and this llama one is not only cute, but it's a great conversation piece. 'Enjoy It' Quote - I found this quote on Pineterst and din't make any alterations to it. I liked how it was kind of small and off on the side, just gives more of a unique look to the wall. This quote is from The Perks Of Being A Wallflower which is my all time favorite book. 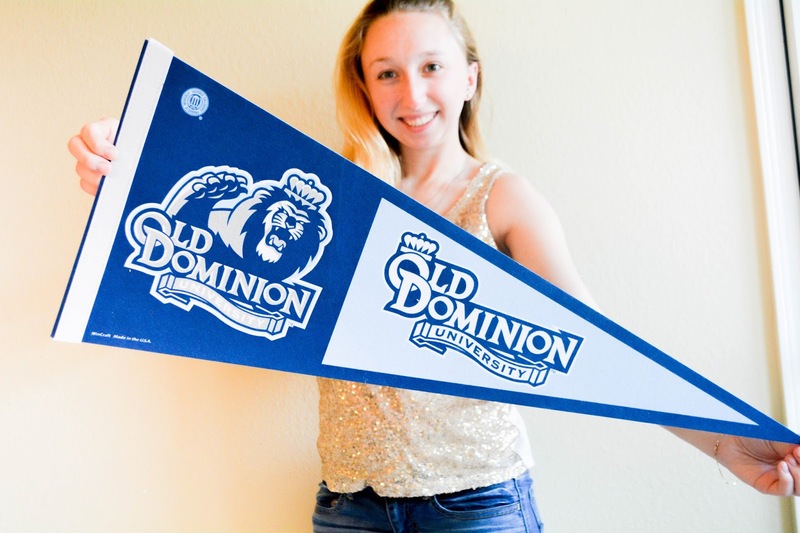 ODU Pennant Flag - my brother got me this for Christmas since we both attend the same college he got it from a store campus. 'Romans 8:38-8:39' - This bible verse is Omar's favorite. He loves it so much he got it tattooed on his back shoulder. Since he can't see it everyday and I'm pretty sure he forgets he even has a tattoo, I decided to make this on Photoshop and print it out for him. 'Home Is' Quote - I found this beaut on Pinterest. All I did was blow it up a bit and print it out. The frame is from the dollar store. Audrey Hepburn Canvas - I got this at Icings believe it or not a few years ago. I was redoing my room back at home and it was Breakfast At Tiffany's theme. Gold Mirror - this is from my grandma, but you can get a wall mirror like this just about anywhere. 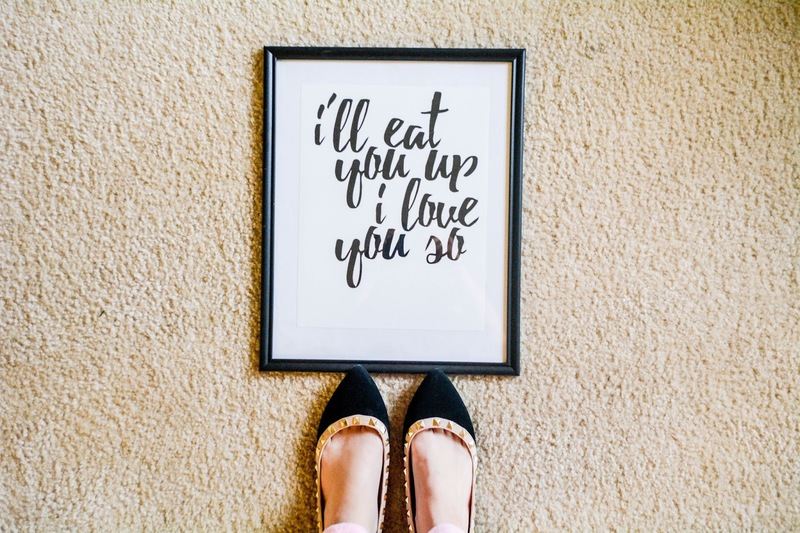 'I Could Eat You Up' Quote - Ten points if you know what movie this quote is from! Again, I made this one. Same thing as the last one; Photoshop, pick a font, layer and print it. The frame is from the dollar store. New York City Print - Another one from Evelyn Henson. Omar and I went to NYC as my Christmas gift from him and it was such a great time. This is a nice way to remember our trip! Marine Dress Blues Canvas Print - My amazing best friend, Rocio, actually hand painted this bad boy for me a couple Christmas' ago. I think it's so unique and clean. It's a nice way to show that I'm proud of Omar's career. 'What Ever You Decide' Canvas Quote - This is a custom made wooden canvas that my mama got me as a surprise when I came home from my summer internship in Arizona. 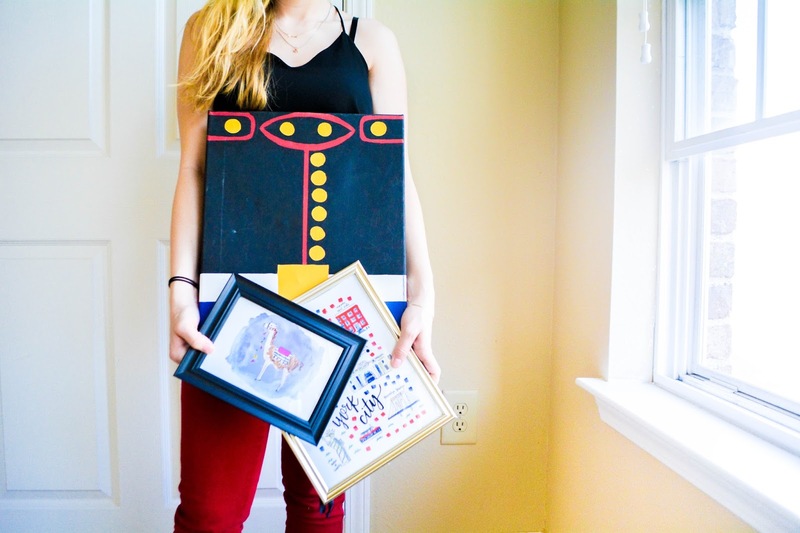 I've mentioned these canvases before and this is just another one that she had done for me. 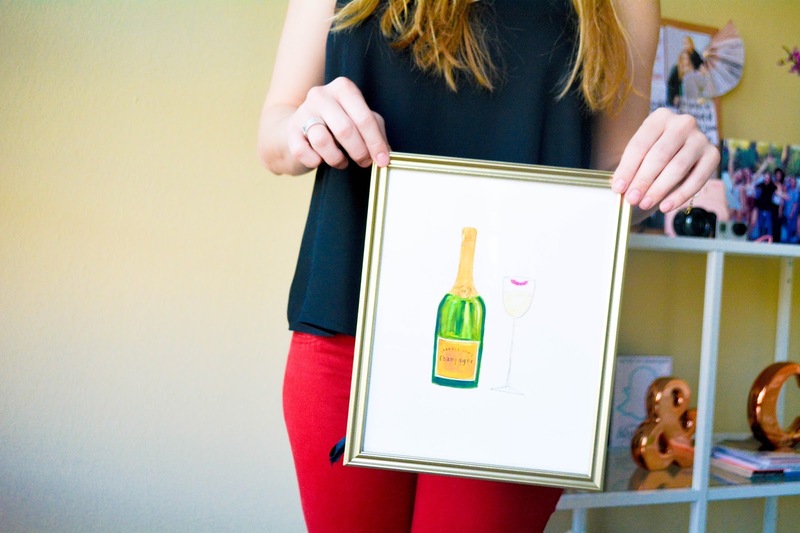 Champagne Print - This is another print from Evelyn Henson! Once you find an artist that you like you seem to buy multiples of their prints. Once I decided what pictures are going in which frame it was really more about the layout. 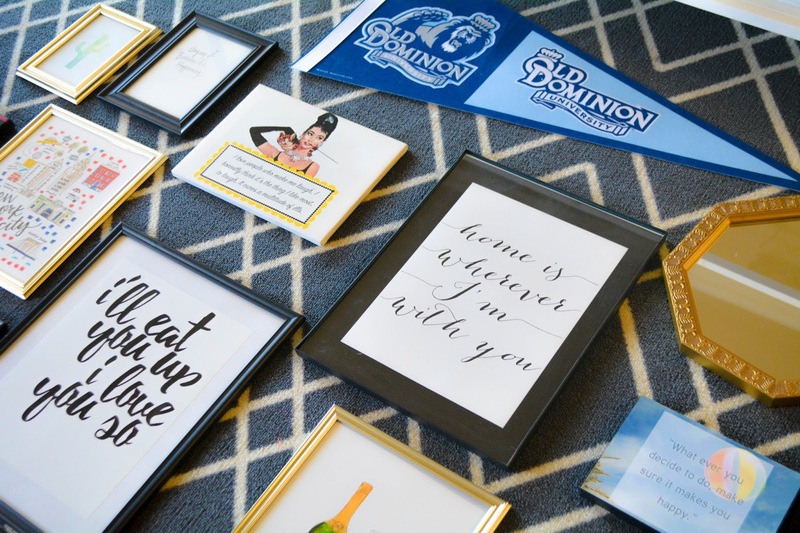 I don't want all my black frames put together and I don't want all the quotes next to each other either. I started by laying them all out on the floor and playing around with what I thought looked nice. 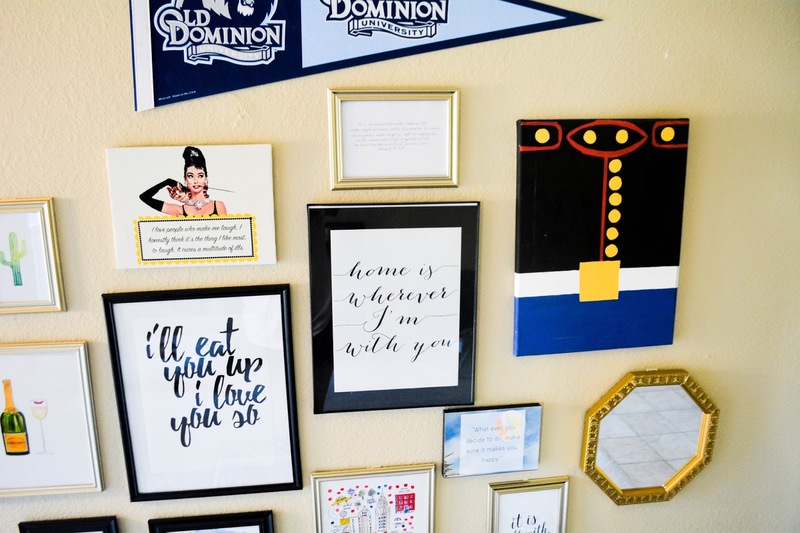 This is a the best part about a gallery wall- It is completely, one hundred percent personal! I made sure horizontal pictures were spread out. I made sure the gold frames were spread out. This didn't take me long to do. It's really like a puzzle. Once I liked what I saw it was time to hang everything up. This next part can get kinda tricky. You have to measure everything and make sure it's spaced out correctly on the wall. There's a lot of tips & tricks out there but honestly Omar and I just kind of winged it. We started with the first picture and worked our way from left to right. We went slowly and didn't try to rush it. We backed up every now and then to make sure it looked good and centered with the couch. Then once we were done that's it! It didn't take long at all to put this gallery wall together and now our home feels a little more like home.